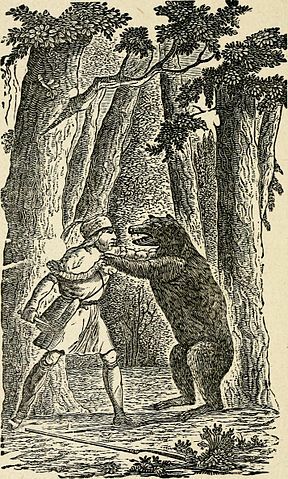 This biography of Daniel Boone was excerpted from Hero Tales from American History , co-authored by Henry Cabot Lodge, and Theodore Roosevelt in 1895. Daniel Boone will always occupy a unique place in our history as the archetype of the hunter and wilderness wanderer. He was a true pioneer, and stood at the head of that class of Indian-fighters, game-hunters, forest-fellers, and backwoods farmers who, generation after generation, pushed westward the border of civilization from the Alleghanies to the Pacific. As he himself said, he was "an instrument ordained of God to settle the wilderness." Born in Pennsylvania, he drifted south into western North Carolina, and settled on what was then the extreme frontier. There he married, built a log cabin, and hunted, chopped trees, and tilled the ground like any other frontiersman. The Alleghany Mountains still marked a boundary beyond which the settlers dared not go; for west of them lay immense reaches of frowning forest, uninhabited save by bands of warlike Indians. Occasionally some venturesome hunter or trapper penetrated this immense wilderness, and returned with strange stories of what he had seen and done. In 1769 Boone, excited by these vague and wondrous tales, determined himself to cross the mountains and find out what manner of land it was that lay beyond. With a few chosen companions he set out, making his own trail through the gloomy forest. After weeks of wandering, he at last emerged into the beautiful and fertile country of Kentucky, for which, in after years, the red men and the white strove with such obstinate fury that it grew to be called "the dark and bloody ground." But when Boone first saw it, it was a fair and smiling land of groves and glades and running waters, where the open forest grew tall and beautiful, and where innumerable herds of game grazed, roaming ceaselessly to and fro along the trails they had trodden during countless generations. Kentucky was not owned by any Indian tribe, and was visited only by wandering war-parties and hunting-parties who came from among the savage nations living north of the Ohio or south of the Tennessee. A roving war-party stumbled upon one of Boone's companions and killed him, and the others then left Boone and journeyed home; but his brother came out to join him, and the two spent the winter together. Self-reliant, fearless, and the frowning defiles of Cumberland Gap, they were attacked by Indians, and driven back—two of Boone's own sons being slain. In 1775, however, he made another attempt; and this attempt was successful. The Indians attacked the newcomers; but by this time the parties of would-be settlers were sufficiently numerous to hold their own. They beat back the Indians, and built rough little hamlets, surrounded by log stockades, at Boonesborough and Harrodsburg; and the permanent settlement of Kentucky had begun. The next few years were passed by Boone amid unending Indian conflicts. He was a leader among the settlers, both in peace and in war. At one time he represented them in the House of Burgesses of Virginia; at another time he was a member of the first little Kentucky parliament itself; and he became a colonel of the frontier militia. He tilled the land, and he chopped the trees himself; he helped to build the cabins and stockades with his own hands, wielding the longhandled, light-headed frontier ax as skilfully as other frontiersmen. His main business was that of surveyor, for his knowledge of the country, and his ability to travel through it, in spite of the danger from Indians, created much demand for his services among people who wished to lay off tracts of wild land for their own future use. But whatever he did, and wherever he went, he had to be sleeplessly on the lookout for his Indian foes. When he and his fellows tilled the stump-dotted fields of corn, one or more of the party were always on guard, with weapon at the ready, for fear of lurking savages. When he went to the House of Burgesses he carried his long rifle, and traversed roads not a mile of which was free from the danger of Indian attack. The settlements in the early years depended exclusively upon game for their meat, and Boone was the mightiest of all the hunters, so that upon him devolved the task of keeping his people supplied. He killed many buffaloes, and pickled the buffalo beef for use in winter. He killed great numbers of black bear, and made bacon of them, precisely as if they had been hogs. The common game were deer and elk. At that time none of the hunters of Kentucky would waste a shot on anything so small as a prairie-chicken or wild duck; but they sometimes killed geese and swans when they came south in winter and lit on the rivers. But whenever Boone went into the woods after game, he had perpetually to keep watch lest he himself might be hunted in turn. He never lay in wait at a game-lick, save with ears strained to hear the approach of some crawling red foe. He never crept up to a turkey he heard calling, without exercising the utmost care to see that it was not an Indian; for one of the favorite devices of the Indians was to imitate the turkey call, and thus allure within range some inexperienced hunter. Besides this warfare, which went on in the midst of his usual vocations, Boone frequently took the field on set expeditions against the savages. Once when he and a party of other men were making salt at a lick, they were surprised and carried off by the Indians. The old hunter was a prisoner with them for some months, but finally made his escape and came home through the trackless woods as straight as the wild pigeon flies. He was ever on the watch to ward off the Indian inroads, and to follow the warparties, and try to rescue the prisoners. Once his own daughter, and two other girls who were with her, were carried off by a band of Indians. Boone raised some friends and followed the trail steadily for two days and a night; then they came to where the Indians had killed a buffalo calf and were camped around it. Firing from a little distance, the whites shot two of the Indians, and, rushing in, rescued the girls. On another occasion, when Boone had gone to visit a salt-lick with his brother, the Indians ambushed them and shot the latter. Boone himself escaped, but the Indians followed him for three miles by the aid of a tracking dog, until Boone turned, shot the dog, and then eluded his pursuers. In company with Simon Kenton and many other noted hunters and wilderness warriors, he once and again took part in expeditions into the Indian country, where they killed the braves and drove off the horses. Twice bands of Indians, accompanied by French, Tory, and British partizans from Detroit, bearing the flag of Great Britain, attacked Boonesboroug. In each case Boone and his fellow-settlers beat them off with loss. At the fatal battle of the Blue Licks, in which two hundred of the best riflemen of Kentucky were beaten with terrible slaughter by a great force of Indians from the lakes, Boone commanded the left wing. Leading his men, rifle in hand, he pushed back and overthrew the force against him; but meanwhile the Indians destroyed the right wing and center, and got round in his rear, so that there was nothing left for Boone's men except to flee with all possible speed. As Kentucky became settled, Boone grew restless and ill at ease. He loved the wilderness; he loved the great forests and the great prairie-like glades, and the life in the little lonely cabin, where from the door he could see the deer come out into the clearing at nightfall. The neighborhood of his own kind made him feel cramped and ill at ease. So he moved ever westward with the frontier; and as Kentucky filled up he crossed the Mississippi and settled on the borders of the prairie country of Missouri, where the Spaniards, who ruled the territory, made him an alcalde, or judge. He lived to a great age, and died out on the border, a backwoods hunter to the last. Daniel Boone's story is featured in our collection, American Biographies for Kids. You may also enjoy visiting American History for more authors and their writings which helped shape the country.